Set timer for 15 minutes. Complete as many rounds of the circuit below as possible, resting only as needed. Record how many rounds and reps you complete. Do not go to failure on any move because that will cause you to need to rest. Stop a few reps short so you can keep moving from exercise to exercise. Rest only as needed because your goal is to do as much work in the 15 minutes as possible. 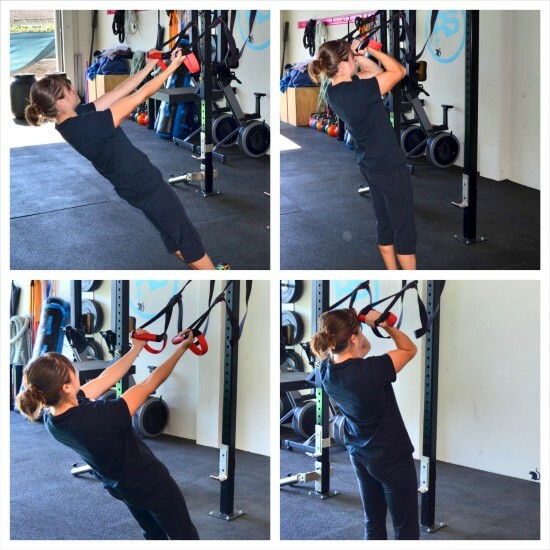 Single Arm Anti-Rotational Row – Place one hand across your chest and grab the strap in the other hand. Set up in a nice straight line, squeezing your quads, glutes and core. Do not let your body rotate. You want to move in a straight line as you row up and down. Pull you arm in toward your chest. Do not shrug your shoulder as you row. Drive the elbow back and pull your hand in toward the bottom of your pec. 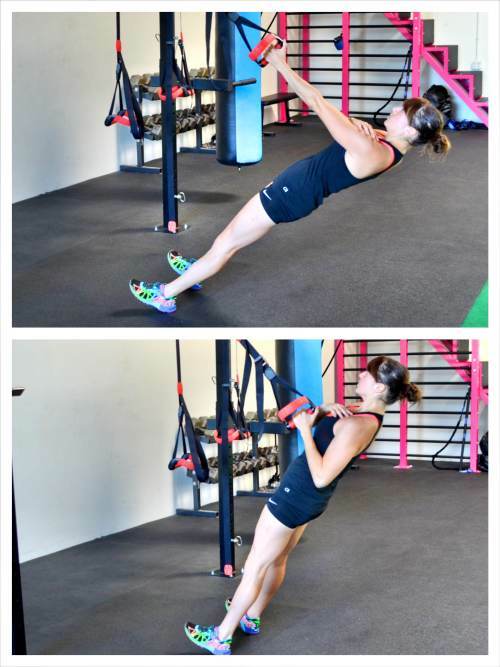 You should move as if both arms are pulling instead of letting the side not rowing rotate open toward the ground. To advance (or regress this move), change the incline of your body. The closer you get to parallel to the ground, the harder the move gets. 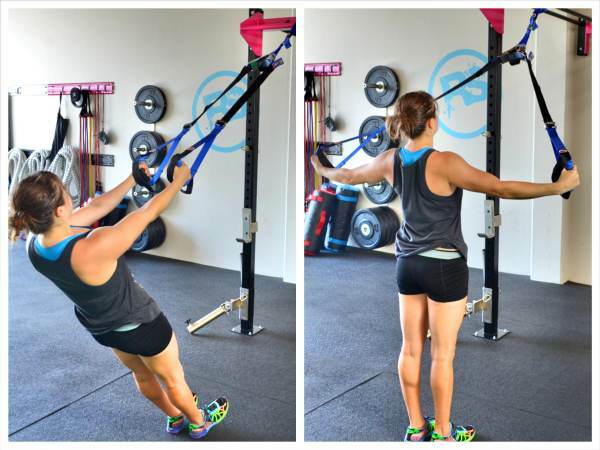 Back Flyes – Hold a suspension trainer strap in each hand. Walk your feet out so you are leaning back. The closer to parallel to the ground you get, the harder the move will be. To start, do not walk out as much as you would for the inverted row. Lean back with your arms out straight in front of you and your body in a nice straight line. Do not let your hips sink toward the ground or your back arch. Then, keeping your arms straight, pull the straps open. Open your arms out to the side at shoulder height. Do not shrug your shoulders as you pull your arms open. Make sure your body stays in a nice straight line as you pull yourself up by opening your arms. Then slowly bring your arms back together and lower yourself down. Then pull your arms open again and repeat the fly. Curls – Hold a suspension trainer strap in each hand with your palms facing you. Walk your feet out so you are leaning back. The closer to parallel to the ground you get, the harder the move will be. To start, do not walk out as much as you would for the inverted row. Lean back with your arms out straight in front of you and your body in a nice straight line. Do not let your hips sink toward the ground or your back arch. Then, keeping your elbows at shoulder height, curl your hands in toward your forehead. As you curl your arms make sure your body stays in a nice straight line. Then slowly uncurl your arms, keeping your upper arms in the same place. Once your arms are straight, curl your hands back in. Do not let your hips sag or your back arch as you curl.